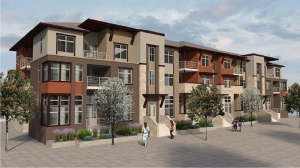 (Denver, Colorado) August 17, 2015 – Encore Multi-Family, LLC, a subsidiary of the Dallas-based Encore Enterprises, Inc., closed on the 5.83 acres of land that will set the stage for the future Encore Evans Station apartment community located in Denver, CO. The apartment community will be a 3-story, Class A, high density, garden-style, multi-family development consisting of 224 units with an attached club house. The project is located just south of Denver’s central business district in the South Broadway submarket. It is well-located, with walkable access to nearby shopping, restaurants, and nightlife. The Evans light rail station is within a half mile (7-minute walk) from the site and provides public transportation to downtown Denver and the DTC business corridor. Construction is expected to commence in early first quarter, 2016, pre-leasing during the fourth quarter, and completion in mid 2017. Denver’s effective rent growth has topped 6% in each of the last 17 quarters including 10% annual growth in the last year, ranking it 3rd among the top markets nationally. Axiometrics reports that the annual rent growth average for the US was 4.31%. ARA Newmark Managing Directors Chris Cowan and Steve O’Dell represented an undisclosed seller in the transaction. Encore Multi-Family, LLC is a subsidiary of Encore Enterprises, Inc. And was founded in 2008 as a fully integrated multi-family developer, owner and operator. The company is involved in all aspects of multifamily development projects and acquisitions including ground-up developments, joint ventures and mixed-use turnkey developments. For more information about Encore Multi-Family, LLC, visit www.encore.bz, or call (214) 259-7000.